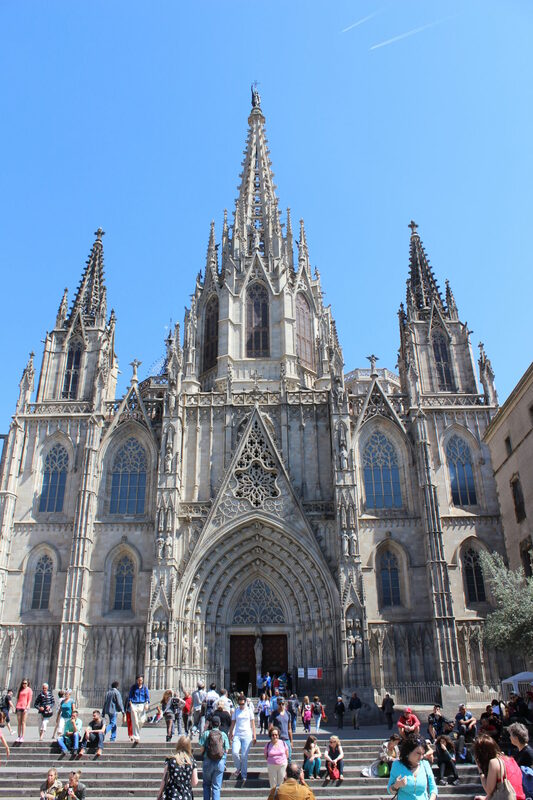 The second full day of my Spain excursion was a 3/4 day of work for me, and a city tour of Barcelona, including the Barcelona Gothic Quarter. I got to work early (830AM) after a night of not sleeping, and dreaming wildly about exploding planets. On the way to the office, which was about a 30 minute walk from my new location at the Claris Hotel, I made a short stop at a bakery for a buttered croissant to go – I annoyed the cashier by not having change and forcing her to break a €20 note. At the office I powered through several espresso grandes until I felt human again, and worked non-stop until all my emails/outstanding tasks, and phone calls were handled. Around 130PM I was finally wrapped up and able to make a beeline back to the hotel to quickly grab my camera bag, and continue walking south on Carrer de Pau Claris to meet Leslie and Marv for lunch at 215PM at the Ohla Hotel Gastrobar, which our guide for the day, Patrick recommended for us. 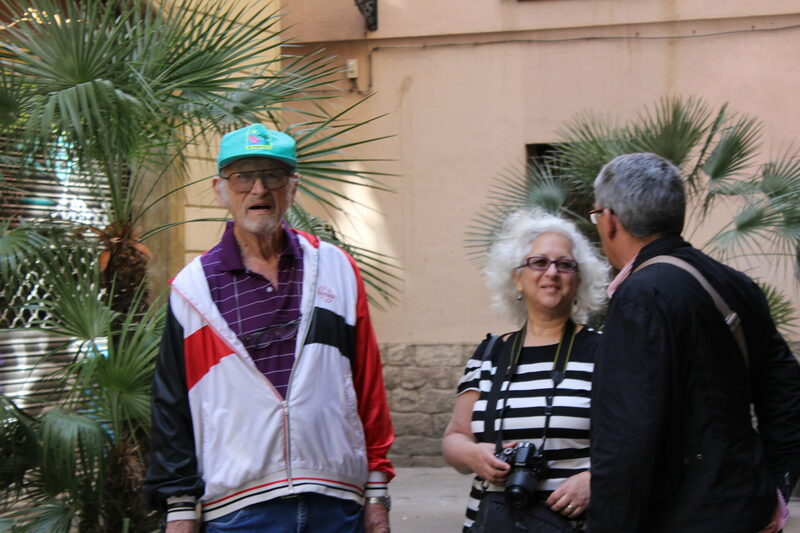 They were coming from a tour of the Palau de la Música Catalan, the major music hall in the city center (and across the street from the Ohla restaurant). Without having wi-fi I did my best to memorize the cross streets but after 45 minutes of walking I doubted myself and thought I might have gone too far. I double back a few streets debating whether to ask a passerby for directions in my broken Spanish. Eventually I realized I had my handy city map from the Hotel Astoria (the best map I’d found of the city so far) and was able to quickly locate the Palau de la Música Catalan – it turns out I was only a block away right when the street becomes Via Laietana (Laietani refers to the original Iberian people that lived in Barcelona and the Catalon coast). One I found that, I found the Ohla across the street easily. Leslie and Marv had just sat down for lunch and ordered, so my timing was perfect even though I was a few minutes late. They said their tour was so-so, and mostly they just sat in the main hall, watched a presentation, and watched people. The worst part, though, was having a brief moment of panic when they realized they missed their pre-scheduled noon tour due to a timezone calculation error on the part of Leslie’s smartphone. But they were able to get in for the 1PM tour, which later we found out is usually quite hard because the reservation timings are fairly inflexible. I was definitely getting used to Spanish lunch, which is the main meal of the day and typically consists of a reasonably priced but elaborate 3-course fix-prix meal. The Ohla Gastrobar, for example, was a Michelin starred restaurant, but we could order a lunch for €16 that a foodie would die for. I ordered a Spanish Omelette (which is more potato than egg, resembling a frittata more so than an omelette), garlic lightly fried cod over chickpeas (similar to my meal the previous night, a Barcelona specialty, and assorted ice cream (chocolate, vanilla, and something I can only describe as tasting like perfume (I think it was lavender)). Towards the end of our lunch, our guide for the day Patrick, joined us and we discussed and re-adjusted the schedule since we were running late. He wanted to pack a lot in so we had to talk him out of about 1/2 of his plan and warned him about moving slowly and the importance of flexibility. 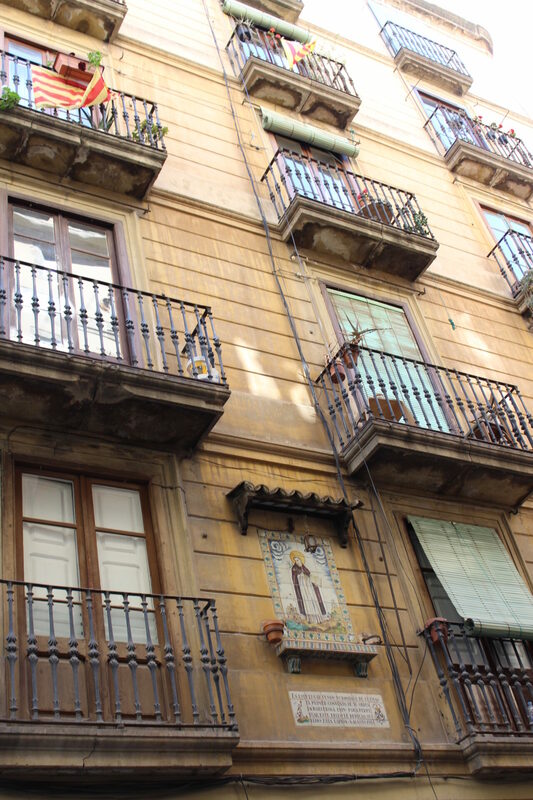 We eventually agreed on the plan of walking from the restaurant to the 4 Gats cafe in the Barcelona Gothic Quarter – where Picasso used to hang out and even paint. Marv had some memories of the cafe which weren’t exactly accurate today about some charcoal drawings being on the wall, hand-drawn by Picasso. Patrick insisted they were never there, and all paintings today were reproductions anyways. There was no way to know the truth, but unfortunately Marv got a little stuck on this and since he was looking forward to seeing them (and didn’t see them), he was disappointed and a little cranky towards the staff. Patrick pointed out interesting tidbits about different (reproduced) paintings in the cafe, such as the large bicycle photo that Picasso was commissioned to do of the cafe owners when he was just starting out. We also learned the history of the cafe, and that it was a nod to the Black Cat cafe in Paris and the Bohemian movement going on at the time. 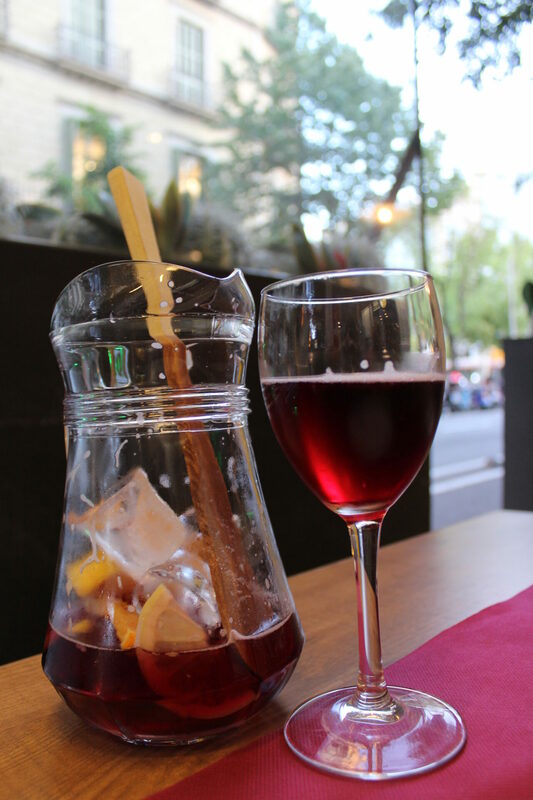 After some drinks, we walked around the old city a bit, did some window shopping, and eventually found ourselves in the main square, in front of a large church built in the 14th century- the Cathedral of the Holy Cross and Saint Eulalia in the center of the Barcelona Gothic Quarter. 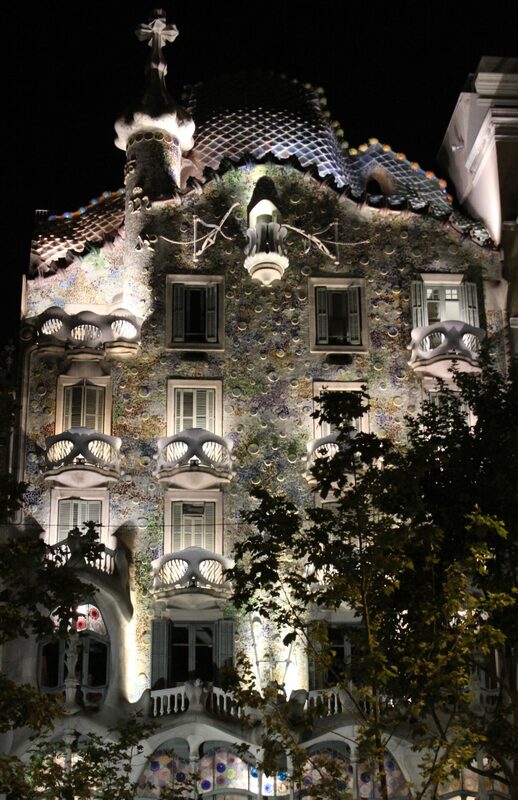 Side note – we asked Patrick to give us the “anti-Gaudi” tour since all of us had been to Barcelona before and had been previously inundated with La Sagrada Familia. We fell into the middle of a random flea market and Marv got sidetracked for a little while look at tchotchkes. While Marv meandered around, Patrick pointed out many buildings of historical and architectural significance and told stories around their creation. He really knew his stuff! 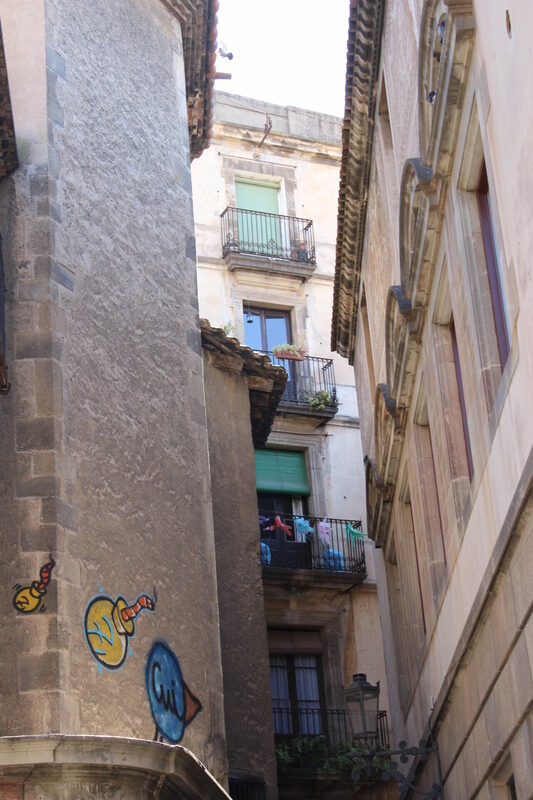 Inside the Jewish quarter, further embedded into the heart of the Barcelona Gothic Quarter, we saw the narrow cobblestone passageways and houses that early residents used to live in, in and around Carrer del Call. I thoroughly enjoyed taking pictures of the picturesque row homes with colorful paint and charming shutters. 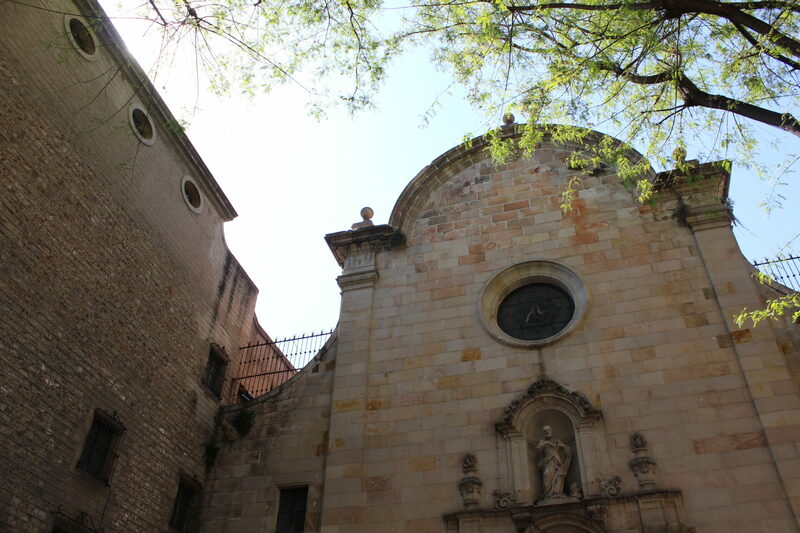 We went by the Sinagoga Major de Barcelona synagogue but didn’t go in, even thought it’s supposedly one of the oldest in Europe (we all also have had enough of churches/religious sites in our lifetime, and especially in Europe). It was fascinating to learn about the flourishing Jewish community that pretty much ended in the 14th century with the outbreak of the plague – many Jews died and the ones that survived were blamed and ultimately killed or forced to convert. Say hi to Marv and Leslie (and the back of Patrick’s head). Besides enjoying taking photos of winding streets and narrow buildings, I also enjoyed the various layers of civilization that had been built, on on top of the other, over the past few millennium. There was a mixture of pre-Roman, Roman, Jewish, Christian, Muslim, Medieval, Romantic architectures all jumbled together. 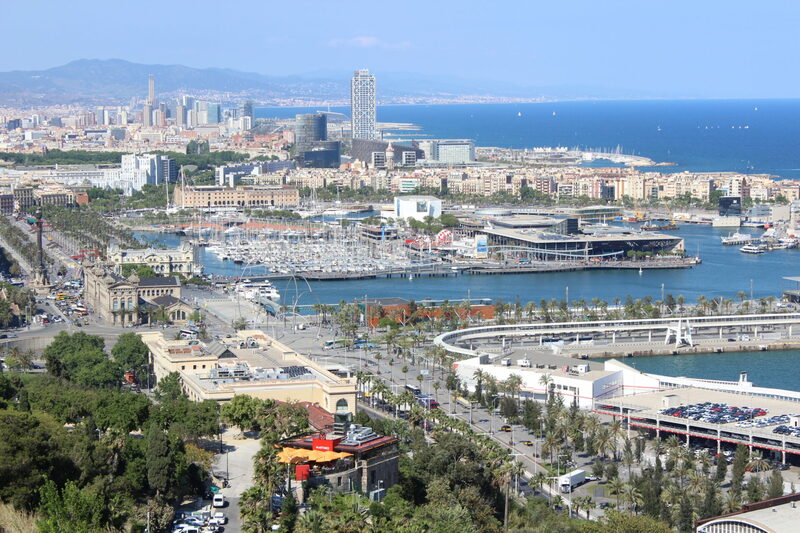 That said, we soon had our quota and fill of old stuff (and of walking) and set out by car to the top of the small hill near Barcelona’s waterfront (Montjuic, which incidentally means Jewish Mountain, where supposedly is a very old Jewish burial place). It yielded some fabuloso views of the waterfront and city as the whole, and Patrick was able to better explain the layout and expansiveness of the city to Leslie and I. On the way down we passed the Olympic stadium and related facilities that were now converted into concert arenas and public spaces. The rest of our drive during the afternoon consisted of checking out the wealthy villa/single-family home area North of Avinguda Diagonal in the suburbs. On the way we passed some more examples of unique Barcelona architecture, mixing old with new. We appreciated how much this city valued good design and aesthetics. Patrick pointed out a spot for dinner, Tapas 24, and then dropped us back off at the hotel. Leslie and I thoroughly enjoyed the tour and were very happy with Patrick’s level of knowledge and especially his passion in communicating it. Back at the hotel I showered and then we headed out for a tapas dinner. We got to Tapas 24 too late to be seated immediately (830PM) and the wait was going to be about 30 minutes (that’s what you get for going to a place with a celebrity chef), so settled on the place next door. It was good but I seriously don’t event remember the name (it might have been Thai Barcelona)! The sangria was the best part. Even though it had an Asian theme they served traditional tapas which were some of the largest tapas portions I’d seen yet – especially the cheese plate (enough for leftovers the next day). 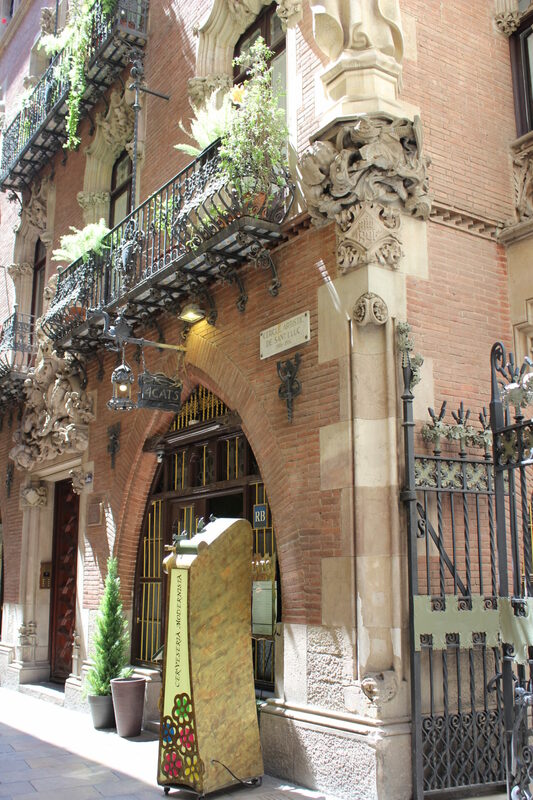 On our walk home we decided to take the Carrer Gran de Gràcia, Barcelona, which is the high-end fashion district street. We enjoyed window shopping Europe’s best brands and seeing some unique architecture as well. We slept around 1130PM (although I stayed up and worked until 1AM). I finally got a good (but not long enough) night’s sleep. Wonderful! Patrick is pretty knowledgeable.